This month in the .177 class Donnie Reed posted the highest score with his new main Hunter Field Target gun, the Daystate Wolverine R. Donnie shoots the JSB 13.43gr Old Design Monsters and is giving the Hawke Airmax 30SF 8-32x50mm scope a try this season. Dennis Baker came in second via his 6 X’s which breaks a three way tie for the position. Dennis shot his Daystate Red Wolf with the Hawke ED Sidewinder 10-50x60mm and used the JSB 13.43gr Redesigned Monsters. Since both Donnie and Dennis are Baker Airguns employees, they are exempt from winning the $50 prize. That leaves Mark Taylor and Chad Kentner tied for the money prize. They both shot a 238 with 4 X’s, so this one went down to the number of 10’s each scored. Mark Taylor narrowly took the win with 11 scored 10’s over Chad Kentner’s 10 scored 10’s. 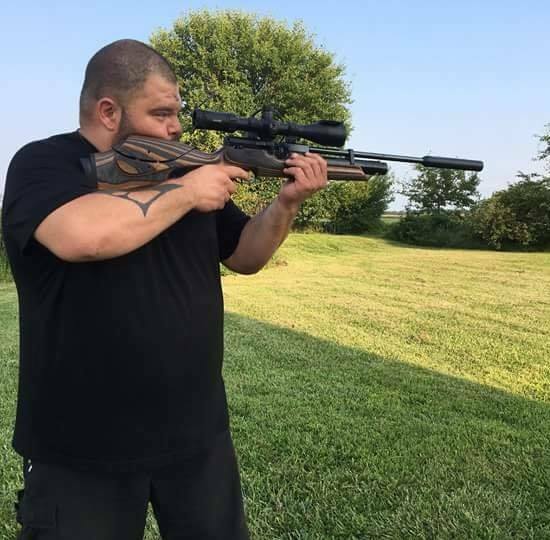 Mark shot his (unregulated) Air Arms S510 with the Hawke Sidewinder 8-32x56mm and used the JSB 13.43gr Redesigned Monsters. Kurt Blank won the .22 class this month using a rifle he bought the same day! He shot a 234 and 7 X’s using his brand spanking new FX Crown in the Green Hunter Laminate stock. It’s one gorgeous gun. He is using one of the first focal plane Sidewinders, namely the Hawke FFP Sidewinder 8-32x56mm. He shot the JSB Heavy 18.13gr pellets. Dennis Baker shot his custom .20 caliber Steyr LG110 with the Hawke ED Sidewinder that he used to take 8th place in the Pyramyd Air Cup field target match this past year. Doug Coldren wasn’t far behind at 227 using his Brocock Bantam Sniper and Weaver Classic 4-16. Doug Coldren did win the money prize in the .25 class this past month using his other Brocock Bantam Sniper, though Dennis did take first with his R.A.W. HM1000. Both gentlemen used an Aztec Emerald, though each of different magnification. They both also used the JSB Exact 25.89gr pellets. We hope to see more participation in the .25 class in April. We would like to congratulate our winners, and thank everyone for their participation! We hope it was as much fun for you as it is for us, and also that we’ll see you to shoot again this month. Regarding the Monthly In-Store Benchrest Results for March, what was the shooting distance for the .177 class competition? Hello, Kent. We shoot at 20 yards using a shrunken USARB Official Target. USARB dictates a 25 yard distance with the official target. This might lead you to believe that our unofficial 20 yard distance is easier, but it turns out that isn’t the case. We shrink the official USARB target to fit on an 8.5×11″ piece of paper. The end result is that the angular size of our target at 20 yards is 20% smaller than the official target at 25 yards. It’s quite challenging.